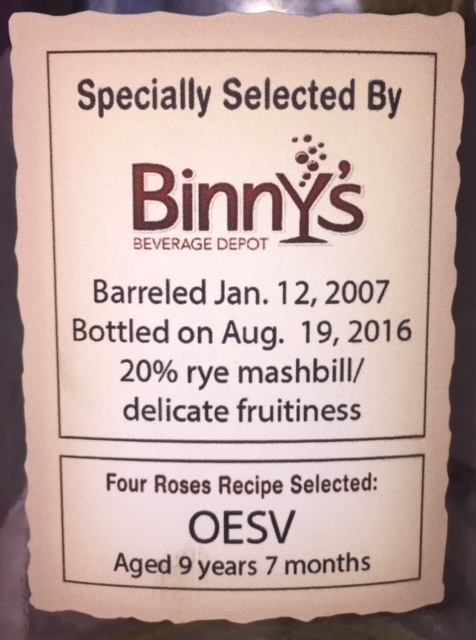 This is recipe number seven of the ten different Four Roses recipes that I've had the chance to try (and I've got OESK sitting in reserve--just need to find an OESQ and an OBSO). Spoiler alert--as with every other Four Roses private selection I've tried, this one is also very, very good, even if not the best of the bunch. The nose on this one is mild, certainly milder than past private single barrels I've had, which have always come across to me as being very bold and in your face both in smell and flavor. It is heavy on the caramel and vanilla, and it has a more pronounced woodiness to it than others. Interestingly, though, there as a noticeable wintergreen mint note to it, something I've only noticed before in certain ryes. The palate is full-bodied and rich, heavy on the cinnamon and vanilla, kind of like a chai tea latte type of flavor. The cinnamon spice lingers at the back of the throat for a nice, long time. There are also distinct cinnamon notes, kind of a corn flake flavor that I usually don't get from Four Roses products. What wasn't there, at least on my first taste, was that wintergreen flavor that I got from the nose. Despite its proof, this bourbon had no real burn. Rather, it was a complex and flavorful bourbon, thick and oily, yet very easy to drink. That oily texture really coated my mouth, allowing all the flavors to linger for a bit, and after a few sips, that's when I noticed that cool minty-nesss, not on my tongue or at the back of the throat, but rather on the roof of my mouth, seemingly just lingering there. Towards the end of the bottle, the caramel flavor really took center stage, like I was drinking a Werther's Original. That cooling mint that I was looking for at first stuck around throughout, but was more of an afterthought. Rather, it was that rich, thick caramel coating that was prominent. The last few pours had sweetened significantly, making for a damn good drink. If I were grading on the last couple pours only, this is an A+. Although I wish it had been that good throughout, though, it was nonetheless very enjoyable from beginning to end, even with the odd mint and corn flake notes thrown in there.